It wasn’t easy, but I finally made vegan mandu last week. This was a challenge since I had never even eaten kimchi mandu before. and I decided to use our aging kimchi as the basis of these dumplings. I grew up eating mandu made from ground pork, cabbage mixed with other finely sliced vegetables. I used my usual variety of mushrooms as the “meat”: fresh shiitake, king oyster and oyster. Here is the recipe I developed. I hope you enjoy it and if you make modifications, please let me know! To cook (and then eat while they are hot…mmmmm! ), heat a non-stick pan with a tablespoon of vegetable oil such as canola or sunflower oil. Over medium heat, fry each side for about 3-4 minutes each. They should be sizzling gold/light brown. (Caution: if the heat is too high, then you will have black burnt patches which I unfortunately have in this batch). I’ll be honest with you. I tried to make my own wraps. They were tasty, but the recipe I first tried rendered FAR too few wraps. It was also very slow going and tedious. I quickly had to opt for the ready made kind which luckily one of the Asian stores (not both) had in their freezer. They are 1,25 EURO a pack here. I will continue to experiment in finding the best wrap recipe for my filling. My oldest daughter, the Korean food diehard, loved these. And she was OK with eating the spicy ones. The other two kids were somewhat neutral. My husband really liked these and if I hadn’t had such a negative experience with making the dough and running out of time to complete everything by the time I had to pick up the kids from Kindi, I would think of this recipe with some fondness. 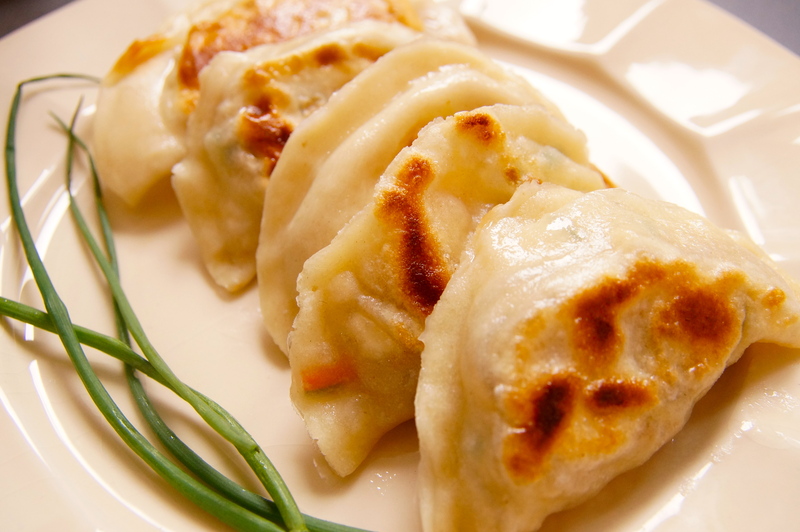 I know now to better plan — make these when I have the help of my husband to chop and a team of people to help assemble and make the dumplings, just like we did when I was growing up. They are handy to have in the freezer (freeze first spread out on a baking sheet and then after a few hours you can transfer into another airtight container) and make a great addition to soups such as ddeok-guk and ramyun and make an instant banchan. Now that Lent is over, I’ll post my mom’s recipe with ground pork in it in the next month. Throughout my efforts to try to eat vegan as much as possible during this Lent season I have felt that I’m not a real vegan. I just play one on the internet. Tags: cooking Korean in Germany, Jane, kimchi, Korean food in Germany, Lent, mushrooms, vegan Korean, vegan Korean dumplings, vegan mandu. Bookmark the permalink.